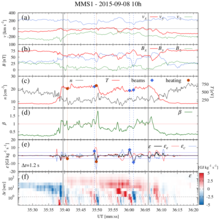 The description of the local turbulent energy transfer and the high-resolution ion distributions measured by the Magnetospheric Multiscale mission together provide a formidable tool to explore the cross-scale connection between the fluid-scale energy cascade and plasma processes at subion scales. When the small-scale energy transfer is dominated by Alfvénic, correlated velocity, and magnetic field fluctuations, beams of accelerated particles are more likely observed. Here, for the first time, we report observations suggesting the nonlinear wave-particle interaction as one possible mechanism for the energy dissipation in space plasmas.